When I asked my husband if he wanted the sweet or sour fiddlehead pickles, he voted for sweet, so this year it will be just sweet ones. 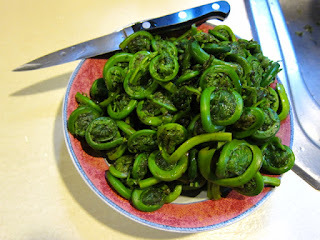 I packed the fiddleheads into 5 half-pint jars and poured the cider vinegar syrup over them. They're in the canner now for 10 minutes. I haven't had a whole lot of foraging luck due to the rain, but I did discover wild carrots in the back yard and tasted a Solomon's Seal rhizome (yum!). Yesterday at the stables I found curly dock, a huge amount of chickweed, and some kind of cress/mustard green thing. Tasted a bit like arugula. Looked a bit like it, too. 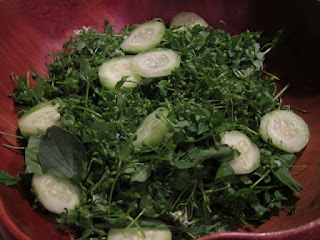 Anyway, I brought all that home and I'll be using the curly dock tonight in a risotto, but last night we had a salad with the chickweed, cress, a little of the curly dock (the small leaves), and garlic mustard flowers. I liked it, but my husband said it tasted like freshly cut grass smells and, being a bitter taster, was abruptly put off by the cress. As was the 10 year old. I guess being a bitter taster makes foraging just that much harder. Currently I'm supposed to be at a Tai Chi class in the park, but it's raining so I bailed. Not that I mind the rain. It's been such a dry winter and spring so far! That fiddle head recipe looks good!